Heavy-duty steel side pipes securely hold these moisture-proof cots. Cots are woven from vinyl-coated, heavy-duty polyester for long use. All bed seams are heat-sealed by radio frequency welding to eliminate tears or loose threads. 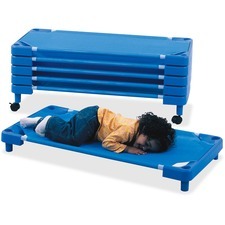 Round leg is designed to nest with most other cots. One-piece, molded, industrial-strength ends are rounded for safety. Tip-proof, low-profile design offers increased safety. Pressure-sensitive name labels easily adhere to the rounded cot ends.